Contains Cocoa Solids 33%, Milk Powder 30% Minimum. Last year I had the pleasure of tasting a variety of Whitaker chocolate bars, I have to say without a doubt this was my favourite! In the UK I buy marvellous creations with popping candy, purely for the jellies inside to alway be disappointed with the lack of jellies! This bar does not disappoint! 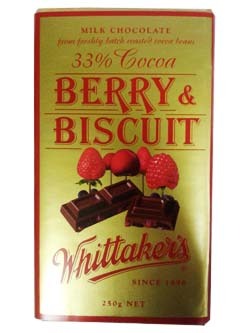 For those of you that haven''t realised Whittakers chocolate is the best and they now do a berry and biscuit variety which is above the Cadbury''s Blackforest. A must try for all Blackforest lovers.